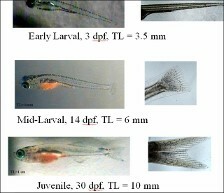 The larval prey capture behavior undergoes dramatic evolution from its early tracking behavior and capture swim. Cavefish show interesting variants and predatory behaviors. Over a period of 6 weeks, predation becomes increasingly fast and versatile, which variants in their mature form are referred to as Juvenile Homing Strikes. 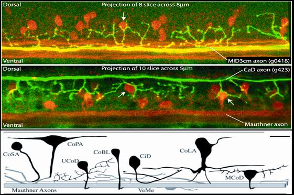 The role of motor learning in this "evo/devo" process is unclear, as is the contribution of innate knowledge (which larval prey capture is entirely based upon). But what is observed is a truly chaotic transitional period, as summarized in our recent Gordon Conference Poster on the subject.